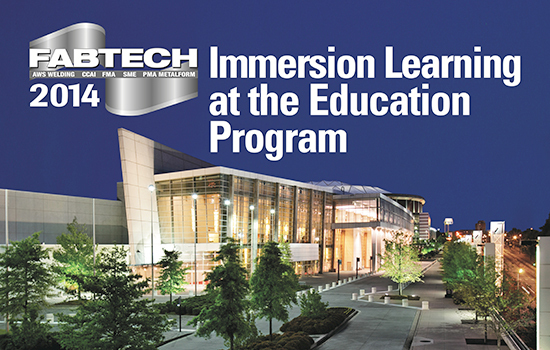 FABTECH offers an array of educational programs—more than 100 technical, operational, economic and managerial sessions where attendees can learn from top industry experts, exchange best practices and explore the latest technology and advancements. 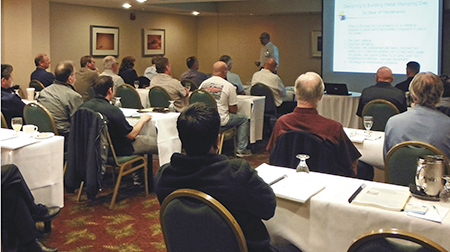 With sessions designed for process, design and production engineers, plant managers, job-shop owners and corporate management, FABTECH provides a valuable learning experience to benefit every member of your team. The Precision Metalforming Association (PMA), Fabricators & Manufacturers Association, SME and Chemical Coaters Association International co-sponsor technical sessions on cutting, finishing, forming and fabricating, management, job-shop solutions, automation and robotics, stamping, and tube and pipe. The American Welding Society presents a comprehensive lineup of welding education, including the Resistance Welding School. Here are highlights from PMA’s stamping sessions scheduled during FABTECH. Examine the die and production-part planning process from design to production. This session will demonstrate techniques and software that improves the speed, accuracy and consistency of the production-planning and estimating process. Also covered are recommendations for successful outsourcing of dies and stamped metal parts. Jeff Bennett, Tool Planners Inc.
“It’s not just digging and pouring.” Proper press-pit and construction needs to consider include site-specific conditions and the construction process, such as shoring, dewatering, forming, use of special concretes and mix designs, vibration control, and trenching and conveying systems. This presentation covers the state-of-the-art installation technologies for metalforming presses. Explore the relationship between installation methods and their effects on machine productivity and the surrounding environment. The characteristics of a variety of isolators and mounting systems also will be covered. Attendees will gain the ability to determine when an in-die system is appropriate and how to properly evaluate a project and recognize a good opportunity. The presentation also includes working animations of the internals of the die tooling and photographs of typical and unique projects. This in-depth presentation addresses the various methods used for in-die and in-slide welding of hardware to stamped parts. Detailed presentations of various tool designs incorporating in-die welding will be offered. George Keremedjiev, Tecknow Education Services, Inc. This presentation will discuss all phases of press repair, rebuilding and upgrading, including when to rebuild or not rebuild, choosing the right press candidate, rebuild or buy new or used, understanding the rebuild process and new feature upgrading. Providing safe solutions to new automated stamping presses and related equipment provides challenges at many levels. Safety technology involving ASi-Safe and Safety PLCs provide solutions that assist in faster installation times over conventional safety relay integration methods. This presentation will address common misconceptions and challenges regarding aluminum stampings while providing process guidelines and practical stamping solutions. Topics include product design, selection of tool steels and surface coatings and establishing proper punching and cutting clearances. Peter Ulintz, Anchor Manufacturing Group, Inc.
A coating system that will not alter the core hardness of the tool-steel substrate or result in a dimensional change is critical. Within these constraints, the ideal option is a physical vapor deposition (PVD) coating. James Kaszynski, Böhler Uddeholm Corp. This presentation will review a range of examples of stamped parts from class A and class B automotive parts to deep-drawn and special applications such as fineblanking. The capabilities, advantages and potential future applications of using servo-drive technology as compared to traditional methods will be compared and explained. This workshop introduces the basics of in-die sensing for die protection. Starting with an overview of the different types of sensors commonly used for die protection, attendees will learn how to select and properly apply the right sensor for any application. Real- world examples will highlight the advantages and limitations of each sensor type. Topics covered include: strain analysis for prediction of formability, common failure modes of sheetmetal parts, circle-grid and thinning analysis and finite-element analysis of sheetmetal stamping processes. Learn how to read forming-limit diagrams and identify common applications of forming analysis. This session will review examples of how press shops have successfully jump-started error-proofing and traceability programs in their facilities. Topics include industrial RFID systems, the growing use of industrial Ethernet technologies and the universal acceptance of IOLink. Will Healy III and Dave Bird, Balluff Inc. This presentation examines a number of common materials used for automotive and aerospace light-weighting while providing guidelines for designing dies, selecting pressroom equipment and implementing appropriate die maintenance routines based on specific material properties. This tutorial describes best practices for die protection and automated in-die part-quality measurements. It will showcase actual tooling examples from the very best practitioners in the field of dies and sensors, including the use of self-adjusting dies that compensate for material changes. Ed Steineback and Mike Williams, Magna/Cosma International Eagle Bend Manufacturing, Inc. Learn the practical methods to select, apply and integrate sensors and control systems. Also covered: how part tracking can verify critical part features, and result in significantly increased machine utilization and more reliable die protection. Learn how to correlate mechanical properties such as yield stress and elastic modulus to springback; identify methods to predict and address springback during design and engineering; and define reasonable expectations of springback and stamping-process repeatability. Learn how controllable force profile can alleviate the pains of forming high-strength steels. Topics include how to decrease stations using dynamic force; mimic a double-acting press using reverse forming; and how to create a more repeatable process using proper feedback and on-board electronics. 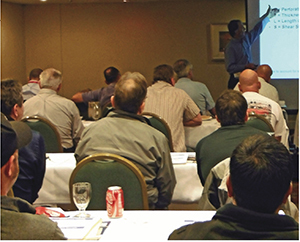 Topics include best practices for lubricant application, and which parameters to monitor when testing a new lubricant for determining cost effectiveness, quality improvements and process acceptance. The crisis in finding skilled labor has led some companies establishing internal technology training academies. Mr. Keremedjiev will present a detailed tutorial on this topic, while Mr. Hudson will present a case study of how nth Works established its own skills and youth apprenticeship program.